Run time: 3 hr. 33 min. Synopsis: Everyone's favorite law enforcement, SUPER TROOPERS are back by popular demand with the long anticipated follow up to the cult comedy classic SUPER TROOPERS 2. 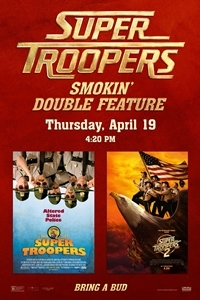 On Thursday, April 19th come see the Smokin' Double Feature, the original and hilarious SUPER TROOPERS and the highly anticipated SUPER TROOPERS 2, for one low price. Both films are rated R.